Vermeer recently introduced the newest addition to its Navigator family of horizontal directional drills, the D220X300 Navigator HDD at the 2013 International Construction and Utility Equipment Exposition in Kentucky USA. 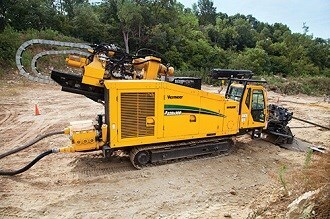 Vermeer claims its new D220x300 Navigator horizontal directional drill is the most versatile in its class. According to Vermeer, the new drill has twice the power of its size, making it the most versatile horizontal directional drill (HDD) in its class. The D220X300 drill has 108,862.1 kg of thrust/pullback and 40,945.7 Newton metres of rotational torque. Vermeer pipeline business segment manager Jon Heinen says the drill was designed to meet growing demands in the energy sector. "As energy demands continue to grow – and with increased exploration of unconventional natural gas reserves, the scope of work changes – the HDD contractors require a drill that can help bridge the gap," he says. "With the shale play, the industry is changing and contractors need equipment than can help fulfill these changing specifications." Vermeer says the D220X300 HDD has a high power-to-size ratio for its footprint of 27 foot (8.2m) length and 8.5 foot (2.6m) width; giving it the versatility to perform urban utility work as well as large pipeline installation. The drill is self-contained, with an on board operator cabin, mud pump, optional crane and rod stager. The on-board Weatherford triplex mud pump has a maximum capacity of 330 gpm and provides sufficient flow of drilling fluid for large-diameter pipe pullback, and can efficiently power a mud motor for pilot bores in hard ground conditions. An optional knuckleboom crane can be mounted on either side of the drill (front base anchor) and provides easier manoeuvrability of drill rod or heavy tooling. A pin-able, open-top vise design allows for passage and more efficient installation of larger downhole tooling, such as non-mag collars and mud motors. The sliding vise can clamp the rod connection at various positions within a 23-inch range, allowing for recutting of drill pipe threads and accommodation of inconsistent pipe lengths. The D220x300 HDD sliding-arm rod stager can stage five rods at a time, allowing for increased boring efficiency. A floating spline shaft design on the rotation gearbox minimises the need for the drill operator to feather carriage during drill rod makeup and breakout, reducing rod and drive chuck thread wear. Adding to the smaller footprint, the drill utilises 20-foot (6.1m) rod instead of the longer 34-foot (10.7m) Range II drill pipe, which is standard for a drill of this capacity. The rod is manufactured with API standard couplings, which will accommodate most common tooling in respective applications. The D220x300 shares the same control platform as smaller HDD drills in the Navigator series. This allows drill operators the ability to operate a variety of drills, and will limit the time needed for new operator training when moving up from the smaller drills. A remote tracking feature gives operator and crew improved visibility of tracking and crane operation on crowded jobsites. For more information, visit Vermeer Australia’s website. Click here to find Vermeer drills for sale. Click here to look up Vermeer drill specifications.